Add to My Favorite Store. 6X-50X Binocular Zoom Stereo Microscope Body Only with Adjustable Diopter on the Eyepieces. This is a binocular zoom stereo microscope body which offers 6X-50X total magnification. It comes with 0.6X-5X (continuous zoom) objectives and a pair of 10X extreme widefield eyepieces. This microscope has a standard mount size of 76mm and is compatible with many microscope stands with 76mm O-ring holder, like single bar or dual bar boom stand, articulating arm boom stand. The microscope objectives also have the 54mm female thread for mounting auxiliary objective lens. With the optional 0.5X barlow lens, the working distance can be as long as 8-3/4" (223mm) , and the field of view can be as large as max 3-1/8" (80mm) in diameters. With the optional 2X barlow lens, it can be having higher power level. It is an ideal instrument for anyone in the semiconductor and electronic industries, research and development labs, gemology, engraving, and serious collecting. 6X-50X continuous zoom stereo magnification. High quality extreme widefield eyepieces WF10X/23 with diopter regulator. 4-5/8" (118mm) long working distance and 1-9/16" (39.5mm) super wide field of view. 54mm (in diameter) female thread for adding barlow lenses. Head: 45°inclined 360° rotatable binocular head. Diopter: adjustable on both eyepieces ±5dp. Zoom ratio: 8.4:1. Interpupillary distance: adjustment 2" 3" (50mm 75mm). Field of view: max 1-9/16(39.5mm). M ounting size of barlow lens : 54mm female thread. Body m ounting ring size: 76mm. Dimension: 7-7/8" x 7-1/8" x 9-1/16 (20cm x 18cm x 23cm). Net weight: 3 lbs 6.5 oz (1.55 kg). 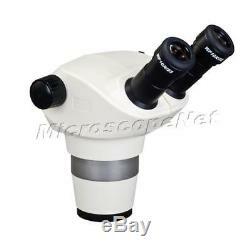 Binocular zoom stereo microscope body only (no stand). A pair of eyepieces WF10X/23. Stand with focus assembly (76mm). Fluorescent ring light for brighter even illumination. LED ring lights for illumination. Gooseneck fiber cold light for flexible lighting angles. Fiber ring light with low heat and adjustable intensity. 0.5X barlow lens for long working distance and large field of view (54mm). 2.0X barlow lens for having higher power levels (54mm). USB cameras for computer or monitor. A: We are happy to leave feedback for our customers once we have been paid and the item has been delivered to the carrier. We would appreciate that once you receive your item, you also leave us feedback. If you feel that you cannot leave a Positive comment with all 5 stars - WE WILL EARN IT. We are here to exceed your expectations! The item "6X-50X Binocular Stereo Zoom Microscope Body Mounting Size 76mm" is in sale since Friday, January 23, 2015. This item is in the category "Business & Industrial\Manufacturing & Metalworking\Semiconductor & PCB Equipment\Inspection Equipment". The seller is "bh542" and is located in Northeast. This item can be shipped worldwide.